This weekend the six of us went to the Hovel-in-the-Hills™: Mary&Me, brother Ian&Sarah, sister Jane&Pete. There was a little trepidation as this was the first time my family have been over to visit after three years of seeing the photographs and hearing the long drawn out saga of the purchase and the building works. You know the sort of thing: I hope they like it, I hope the weather holds, I hope the flights are on time, etc. As it turned out all went as well as I could hope for. Jane and Sarah gritted their teeth, forsook their cleansing lotions and unguents and went hand luggage only which helped a lot. We flew out Friday night, Ryanair Standsted to Bari, picked up the hire car and went straight to Locorotondo, walked through the town and got to the restaurant Centro Storico about 10:15 pm for a late supper. Saturday morning was the usual flurry of workmen. 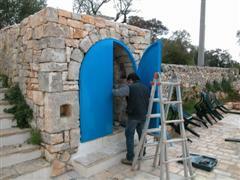 Daniele's collaborator, Stefano, arrived to oversee the locksmith, the heating engineer and the blacksmith. Meanwhile we awaited delivery of the last piece of furniture - a cabinet for the bathroom. 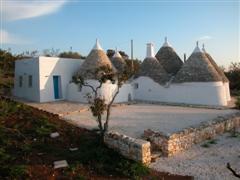 Mary stayed behind while I took the rest over to see Alberobello, a whole town of Trulli. Then back for lunch on our new dining table. 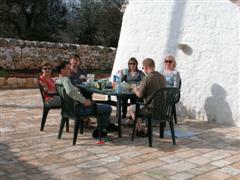 After a siesta we took them in to see Cisternino, our other local town, and settled up with the furniture shop. We went back into Cisternino for the evening meal at Osteria Sant'Anna and it lived up to all that we had told them about it. 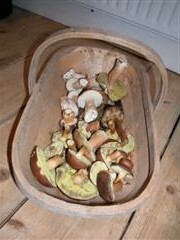 Every year Peter Jordon and his wife Val (Tasty Mushroom Partnership) run a couple of forays in the New Forest. This year we were able to get down to the cottage that weekend and take them out for a meal to repay their hospitality from a couple of years ago (see "How do you know they're toadstools"). Saturday evening we took them to Plummers in Ringwood High Street for a very enjoyable meal. 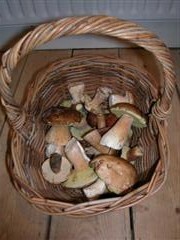 Sunday we joined the other 20 or so mushroom hunters for the morning foray. After a successful morning's picking we all had a lunch of mushroom soup followed by mushroom croustade (cooked by Peter and Val). At that point we dipped out and went back to Wandsworth with our haul: Sunday roast with fried Ceps (aka Penny Bun aka Porcini) and Monday night soup with the rest. 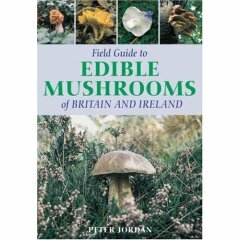 Peter very kindly gave us a signed copy of his excellent new book "Field Guide to Edible Mushroom of Britain and Europe". You can order your own *signed* copy via his website. About four years ago Mary's sister, Sandra, bought Mary a ceramic piggy bank. 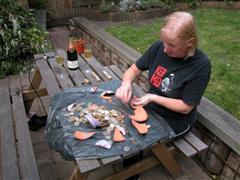 Mary decided she would feed it two pound coins. For the last few years she has spent scarcely a single one. They all went into the jar (along with any she could steal from me). 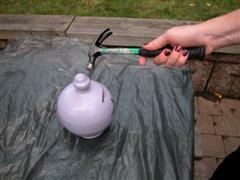 But then it got so full that even with a good shuggle we could not get another coin in so it was time for the hammer! 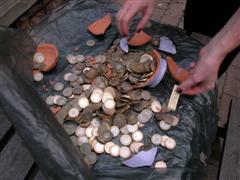 Including three coins in her purse that could not be forced in, the grand total came to a surprisingly tidy sum!! Of course it's all gone now - she went to Max Mara and bought a very fine, brown winter coat and used the change to buy trousers and a dress. I bought it second-hand off Penny (Dave's first wife) sometime around 1984 (give or take a year). It is obviously a man's frame. It makes more sense for a woman to buy a male frame as they are stronger (or lighter for the equivalent strength). The saddle tube had snapped so I had to get that extracted and bought myself the classic Brooke's leather saddle it still has to this day. Over the years almost every part has been replaced apart from the frame, forks and handle bars. The seat post, saddle, wheels, chain rings, rear block, mudguards, panniers, crank arms, pedals have all been replaced at some point. 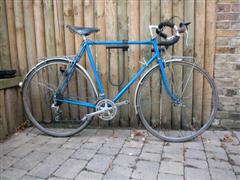 I even had the frame stripped and repainted its current metallic blue colour. 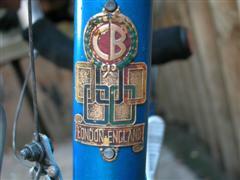 The guys who did it welded a crack near the headset and kindly preserved the CB badge. The model is unknown but I know the frame is 501 tubing. When I worked in London I used to cycle the 9.25 miles from South Wimbledon to Devonshire Square in the City (of London) for four years from the beginning of April to the end of November clocking up over 10,000 miles. 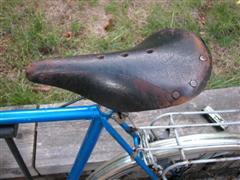 Plus various other excursions means that saddle and my bum have been through a lot together. Then I changed job, started working out of London and the bike no longer got the same usage until this current contract back in London. For the full story of urban cycling this time round go to Like a Fish Needs a Bicycle and work your way forward. 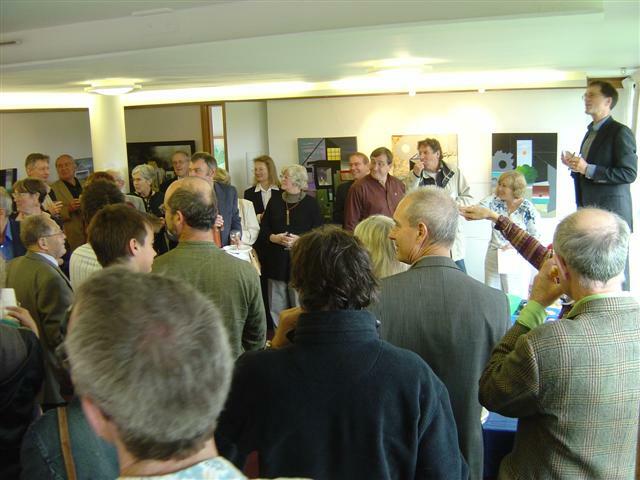 I took a load of pictures of the pictures at the opening of Dad's exhibtion at Wolfson College, Oxford. 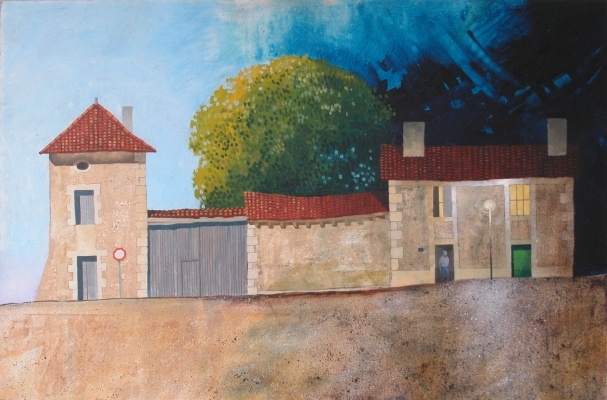 I have reworked his site and started to put those pictures online at http://www.michaelmclellan.com/. Click on Gallery 1 to see thumbnails and links to bigger versions. I have done the first dozen, only 29 to go! This is a holding site at mmenterprises.co.uk until I can get his domain name transferred over and a proper hosted site put up. Another BBR extravaganza down in the sub-basement of the Napoleon cellars, so named because one of the founders, Mr Rudd, was mates with the Emperor who used to frequent the establishment. My ISP's webserver has been down for over 10 days now (zoo.co.uk). Not impressive. I am glad I am not a customer running a business website. So I decided enough of using the free webspace that came with my account, after all you get what you pay for. So I moved my domain name to 123-reg.co.uk, bought a hosting package and re-uploaded my files. Well most of them, more to follow, some to reconstruct / recreate and some to edit the blog links for the pictures. Bear with me while I sort out the stragglers. Let's hope for a more stable future. Open Daily 10am to 4pm subject to College commitments. 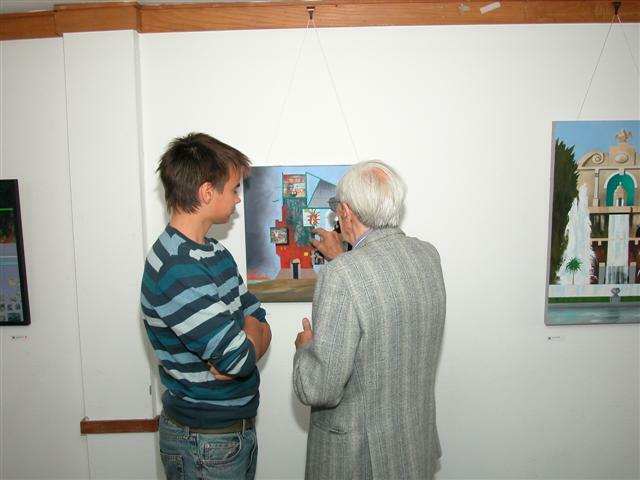 It would help if I had put the details of the exhibition in my previous posts! 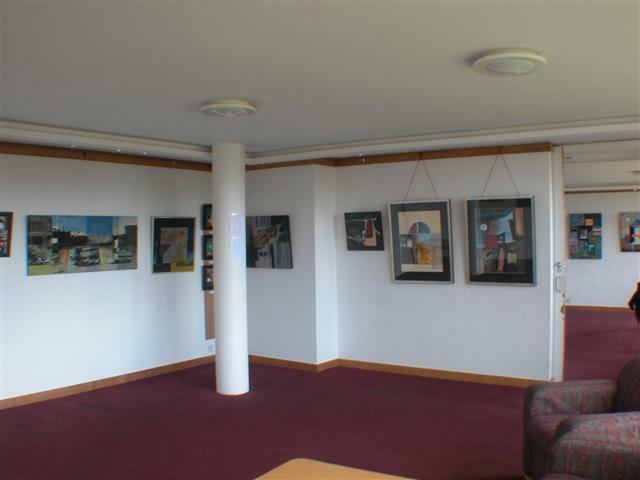 The reason for calling is that the rooms are also used for meetings and other functions, so to avoid disappointment call first. Went to Raj on Friday because my teeth were giving me gyp and it looks like I am down for two crowns and an extraction at Harley Street prices. The latter may be years off but the crowns, numbers 12 and 13, are to be done as soon as I get the x-rays taken (see previously "And finally monsieur a wafer-thin mint"). Meanwhile I am on Corsodyl mouthwash, for the gingivitis. Corsodyl is one of the viler tastes on the planet and wreaks havoc with the taste buds. My tongue feels like it has been lightly sand-papered. I can forget about drinking fine wines until I am off the stuff as everything has hints of sand and glue.